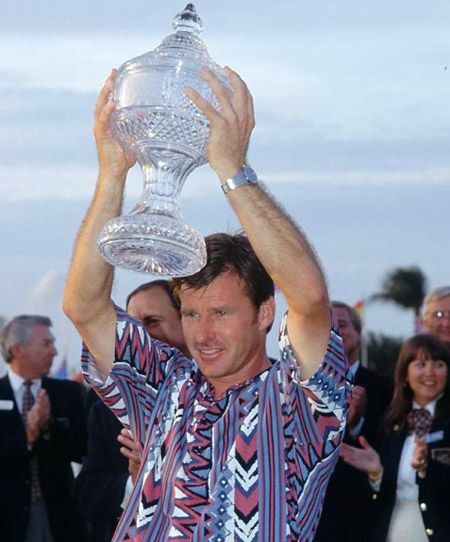 Nick Faldo (b.1957) was one of European’s best golf players in the 1980s and 1990s, and recently honored with nighthood (Sir Nick Faldo) in recognition of an incredible sporting career by the English queen. What most golfers probably do not know (with the exception of the watch connoisseurs amongst them), is the long time partnership between Nick Faldo and Audemars Piguet. Audemars Piguet, King of special editions, created three different Royal Oak watches to honor golf legend Nick Faldo. The first model showed up in 1992, with reference 14790. A rose gold Royal Oak, limited to 325 pieces. In 1997, Audemars Piguet introduced the Royal Oak Nick Faldo edition ref.15090, limited to 150 pieces in stainless steel. And last not but least, and probably the most recognizable Nick Faldo edition, is the 2002 Royal Oak ref. 15190, limited to 450 pieces. This last model has a platinum bezel and a stainless steel case and bracelet. The 1997 model and the 2002 model both came with a Nick Faldo golf bag by Mizuno. 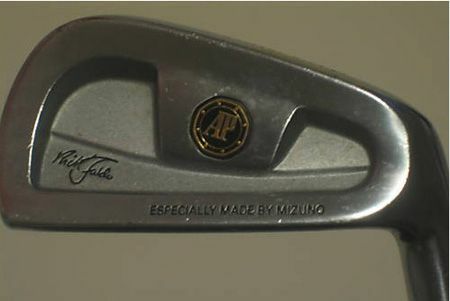 The golf clubs have the Nick Faldo signature and the AP logo, embedded in their famous octagonal shape. Last weekend, I visited Manbodh Watches in The Hague. This watch store has one of the most impressive collection of (vintage) Rolex and Panerai watches, and high end brands like Patek Philippe, Vacheron and – of course – Audemars Piguet. Besides having one of the first Royal Oak Jumbo watches in store (ref.5402) – I didn’t even ask about the price – Manbodh also carried this Nick Faldo special edition. Unfortunately, you’ll have to do it with the stock photo of the Manbodh website. This ref. 15090 Royal Oak Nick Faldo edition comes without the sought after golf bag, but is still worth acquiring/collecting without one. For 4750 EU, you have quite a limited Royal Oak (40mm) in pretty good condition that you won’t see on someone else’s wrist. This Royal Oak has caliber 2225 ticking inside, based on the famous Jaeger LeCoultre caliber 889/1 movement, regarded for being an excellent automatic winding movement. It wasn’t until 2005 that Audemars Piguet did a follow-up on this movement by their own in-house caliber 3120 as found in the current line of Royal Oak (Date) watches. Although it might look like a boring composition of stainless steel (with the grey dial and all), in the flesh, it is a pretty looking watch that really stands out on your wrist. Watches like these really play with (sun)light, even the slightest ray of light will make polished parts (like the white gold screws in the bezel) shine. 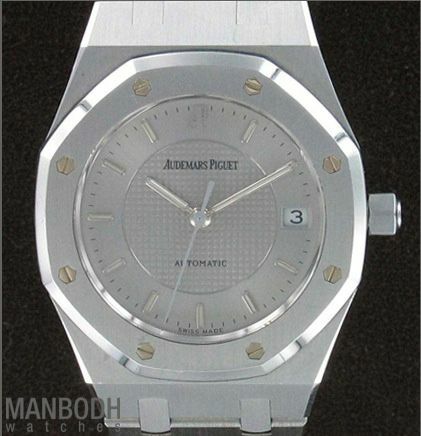 If you can find a better picture of this AP Royal Oak 15090, please let me know.